WATERVILLE – The chair of the State’s Board of Education has been honored for his advocacy on behalf of adult education. Dr. Steve Pound, of Greenville, was recognized as the 2013 recipient of the Gerald N. Levasseur Award, presented by the Maine Adult Education Association (MAEA) at the Maine Adult Education Conference held at Colby College last week. A Millinocket native, Dr. 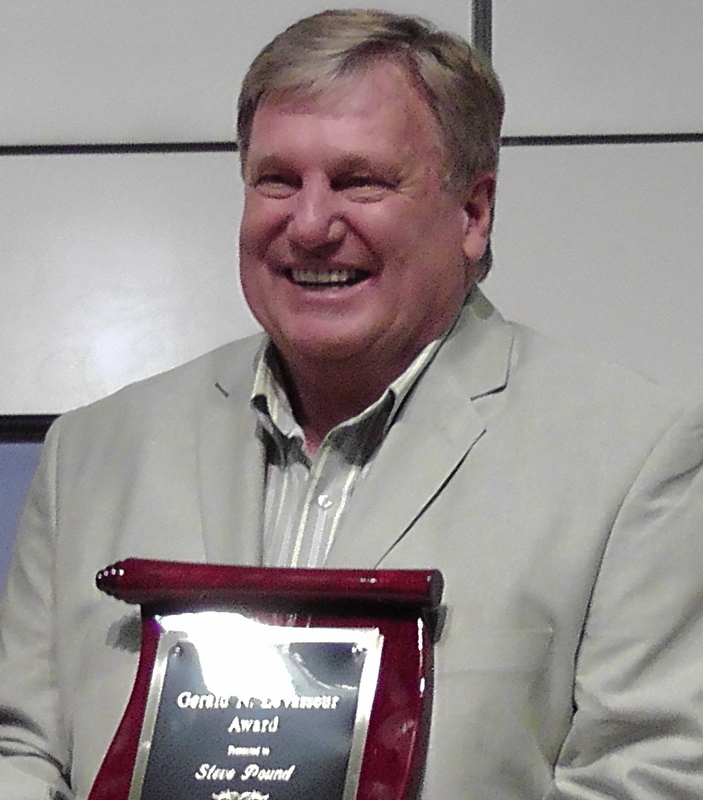 Pound served as Superintendent of Schools in Greenville following a career in education in Canada. He quickly recognized the importance of adult education to rural Mainers experiencing job loss, and took on the role of director of the Greenville Adult Education program. In 2006, Dr. Pound joined the Cianbro Corporation, serving in various capacities most recently as Associate Director for Workforce Development at the Cianbro Institute. Seeing his new company was in need of welders for a project in Brewer building oil refinery rigs, Dr. Pound arranged for many of the state’s adult education programs to offer introductory welding classes designed to identify prospects to go on for further training and to ultimately be hired by Cianbro. This has led to a full-scale commitment to workforce development in the form of the Cianbro Institute, and to a continuing partnership between the company and educational providers including adult education, explained MAEA Executive Director Cathy Newell, who presented the award. Dr. Pound is also a member of many boards including the State Board of Education which he chairs, the Educate Maine board, local workforce investment boards including serving as Past-Chair of the Tri-County Local Workforce Investment Board, the State Workforce Investment Board, and the Maine Employers Initiative Advisory Council of Maine Development Foundation. “In his work with Cianbro and his board service, Dr. Pound has effectively emphasized the importance of adult education to decision makers. This work has been of immense help as adult education is increasingly recognized as a vital element in workforce development in Maine and our nation,” Newell said. The Maine Adult Education Association annually recognizes outstanding teachers, student leaders, support staff and administrators. For more information, visit www.maineadulted.org. For more information about the State Board of Education, visit www.maine.gov/sbe/. Posted on June 28, 2013 May 23, 2014 by Posted in Adult Education, News & Views, Press Releases, State Board of EducationTagged Adult education Maine, Cianbro Institute, Maine Adult Education Association, Steve Pound.